On of the composite digital images created by Ancient Hawai'i. 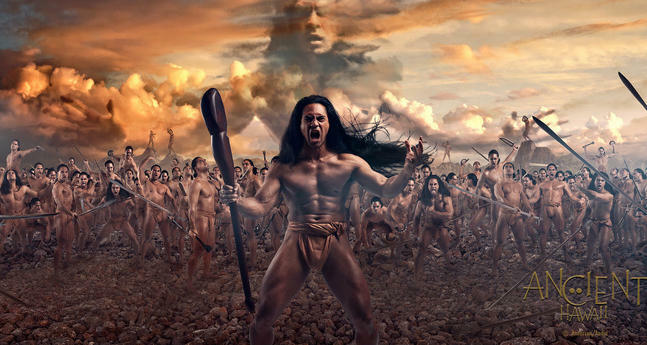 La'akea Suganuma's authentic weapons are brandished by Garmin Pomai Brown, whose images make up the entire army. Conversations about the "CONTACT" show at the Honolulu Museum of Art School. Honolulu Museum of Art School, Main Gallery, First floor. 6– 8pm. PechaKucha 23: CONTACT Eight creative community members will share 20 slides, 20 seconds each, generated from a CONTACT experience. Come early and enjoy Hawaiian music, ono food and drink. Exhibition will be open. 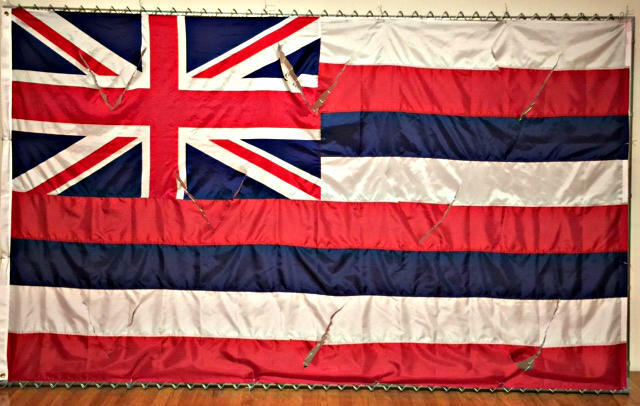 Honolulu Museum of Art School, Outside Courtyard, 7– 9pm. juxtapositions. Personal contact reflections on the films by Kirk to follow. Tickets: $10 General / $8 HMA Members, Honolulu Museum of Art, Doris Duke Theatre, , 7:30-10pm. He Mele Aloha Sing-a-Long! Bring your ‘ukulele and join old time musicians, Aunty Noe Mahoe, Vicky Hollinger and Kimo Hussey along with historian Puakea Nogelmeier and publisher of He Mele Aloha, Carol Wilcox, as favorite old-time Hawaiian songs are discussed and sung with the audience. Tickets: $25 General / $20 HMA Members, Honolulu Museum of Art, Doris Duke Theatre. Contact Maile Meyer (808) 783-2786 or Josh Tengan (808)202-8707 with any questions. For a brief biography of John Dominis Holt. To see the images featured in the upstairs gallery (through April 30) at the HMA School, visit Hawai‘i Ancient. Yes, Honolulu has its own street style and two local authors have tried to describe it in a new book, Honolulu Street Style. Noe Tanigawa reports. The book, Honolulu Street Style, is available through your favorite bookseller.